This is development board for using CNC on Grbl ESP32. It supports all of the current and planned features of Grbl_ESP32. It is a great way to get started with the firmware. It is currently for sale in my Tindie shop. A very modular design – If any of the major circuits get damaged, you can plug in a new one. 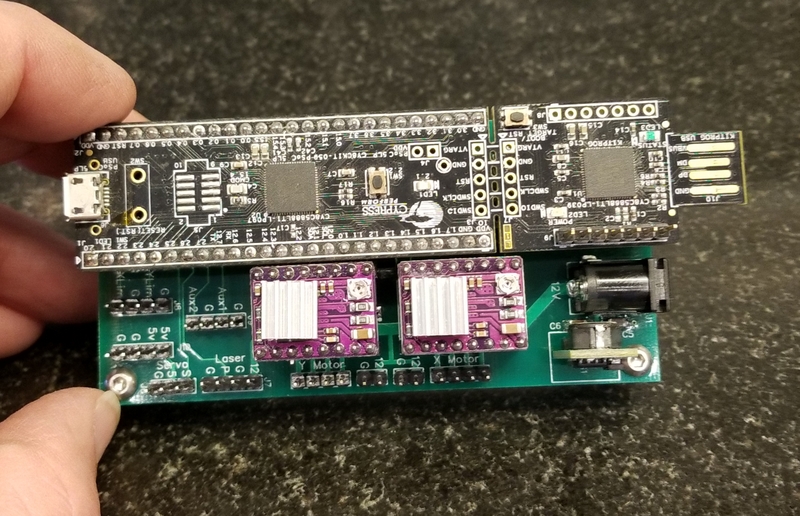 A socket for a ESP32 Dev board also known as NodeMCU 32S. Most 19 pin per side dev boards should work, just check the pins or ask me. (3) Sockets for stepper motor drivers. These fit many types of drivers. The TI DRV8825 type is my favorite driver for this type of application. Micro-step selection jumpers are included. Home/Limit switch connections for XY and Z axes. These also have R/C filters to eliminate high frequency noise from false triggering the switches. Control switch input connections for Feed Hold, Cycle Start, Reset and Door. These have filters as well as pullup resistors, because they are on inputs that do not have internal pullups. 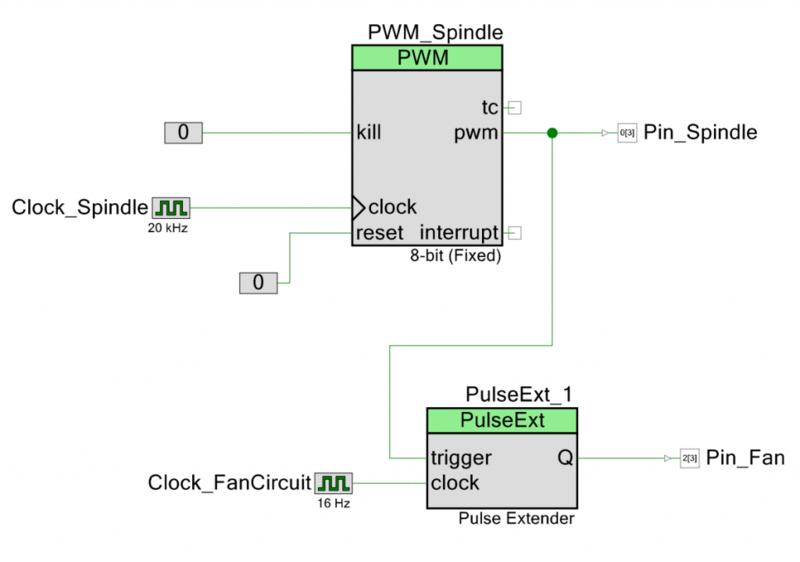 Spindle output for PWM (Speed). Spindle Enable and Direction are also connected, but not in firmware yet. DC-DC power supply. 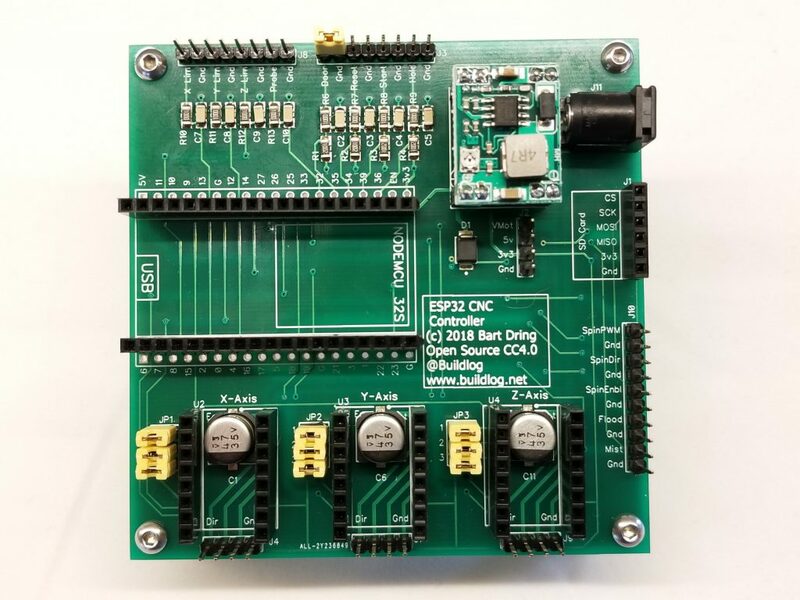 There is a strong 3A DC-DC power supply to run the ESP32 if it is not connected to USB. It is adjustable, 0.8V to 20V, but would typically be set to 5V. It also has connections, for off board use. The design is open source with Creative Commons 4.0 Attribution – Share Alike . Here are the source files. The SD Card pin 5 (vcc) was accidentally hooked up to 3.3V. It should be connected to 5V. The boards have a simple cut and jump. Keep this in mind if you use the gerber files. You can build your own from the source files or you can buy one from my Tindie store. Buying one from me helps support this project. Here is a look at something I have been working on. 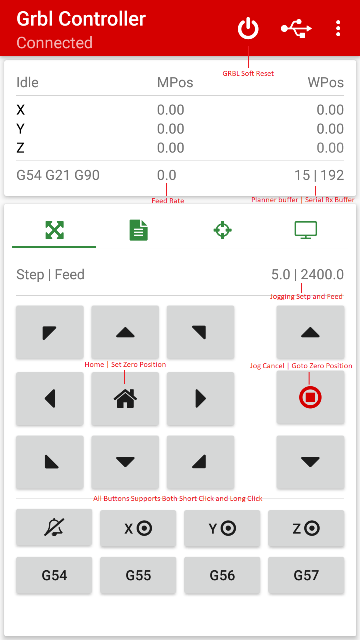 I have added some SD card features to Grbl_ESP32. Grbl works great with senders and really shouldn’t need SD card support. That is true for your typical desktop CNC router. laser, etc., but there are a lot of machines that are not “typical”. I like to make machines I can fit in my backpack or in the palm of my hand. I certainly don’t want to use a traditional PC – Machine setup. I want control via phone or completely autonomous. This means SD card, Bluetooth and Wifi options are critical. Does a machine even need connectivity at all? Running a file from an SD card and uploading new firmware via SD card is going to be critical for some new projects I have plans for. After debating a few methods of implementing this, I decided to do it in a more Grbl’y way, than a Marlin’y way so that it is less likely to break the existing Grbl gcode senders. This means I’ll try to report status and push notifications in a way that won’t break anything. I’ll also follow the strict NIST gcode rules of Grbl. NIST does not have SD gcodes, so they will be more like Grbls $H (homing) than Marlins equivalent gcodes. With that said, if anyone has some suggestions for changes, I am still in a stage where I can consider them. The commands all start with $F (for file). $FM – Mounts the SD card. You do this once whenever you want to use the SD card or after you re-insert. $F=/myfile.nc – This runs the file. Job progress is automatically appended to the end of the “?” command response. like <…….|SD:55.78> where 55.78 is the percent complete. All of senders I have tested (UGS, LaserGrbl, Grbl Controller) are OK with these changes. They continue to request and get status and update the DROs. If they have a verbose option, you can see the job progress. Some (Grbl controller) filter out (don’t display) the [FILE:….] responses even on verbose mode. All can be disconnected during a job without affecting it. Most send a Grbl Reset when reconnected which kills the job. This would be easy to ignore during SD card jobs (not implemented). Look at methods of firmware upgrade via SD card. Can a file be uploaded to the SD card (USB, Bluetooth, Wifi)? Bluetooth Serial has now been added to the master branch of Grbl_ESP32. 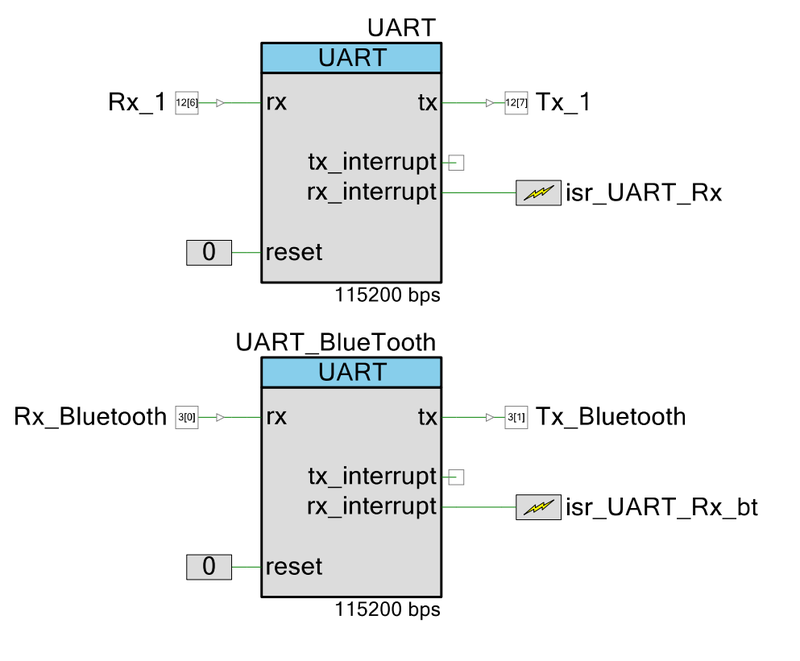 Bluetooth Serial means the Bluetooth connection looks like a serial port when you pair with the device. This is ideal because it allows all existing gcode senders that support serial ports to use Bluetooth. 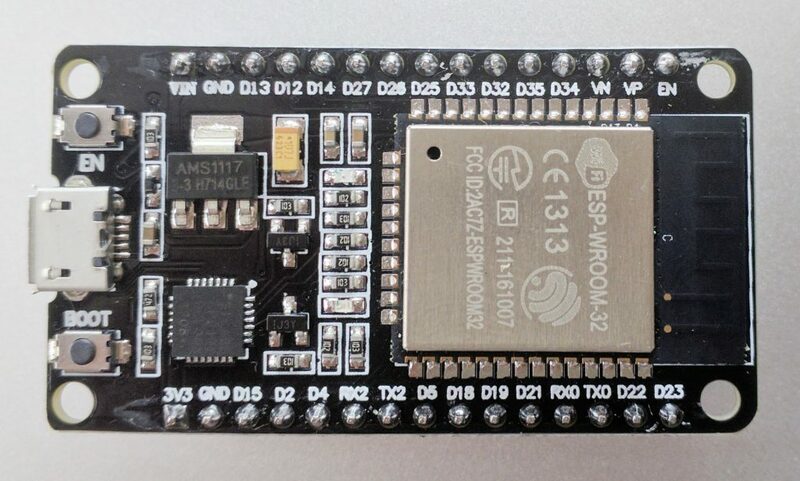 This was added using the Bluetooth Serial library that is part of the espressif/arduino-esp32 development environment. This library is relatively new and has a few issues, but I was able to work around them. Sending Characters: The reporting done by Grbl sends characters a character at a time. This means dozens of calls to the library are needed for each response. This caused characters to be dropped. The solution is to send a full string in a single call using .print(), rather than sending individual characters using .write(). Grbl was written using the character at a time method to highly optimize the reporting. The raw speed of the ESP32 does not require that optimization and the resulting code is much more readable. No Password: The library does not support the use of a password for the pairing. This is a big drawback, and needs to be considered before you enable Bluetooth. Apparently this was due to an upstream component that has now been fixed. Hopefully it means the library will be updated soon. Why and when to use it. 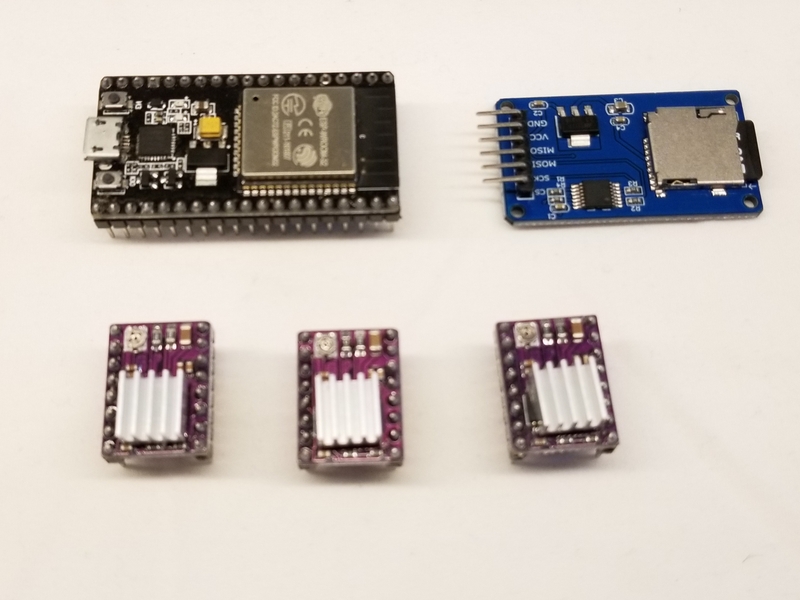 The cost, size and wireless features of the ESP32 are the primary reason I ported Grbl to the ESP32. 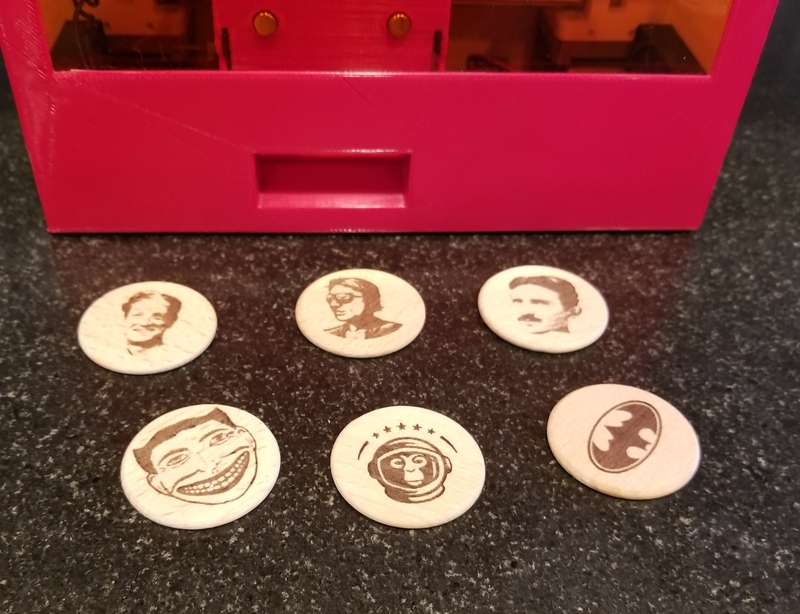 I make a lot of tiny CNC machines. A laptop is likely to be many times the size of the CNC machine. I wanted to control the machines via a phone or small tablet. I have found the connection to be very reliable, even for jobs lasting more than an hour. The phone can even be in the “off” state in your pocket and it will still stream reliably. The battery drain is accelerated, but not significantly (like listening to audio via Bluetooth) You do need to stay within range of the machine, although Grbl Controller (Android) appears to be able to resume a job. It is optional. You enable the feature at compile time. That allows you to save some code space (not really an issue now). Once the feature is enabled, you can still turn it on or off via a serial port command. All Bluetooth traffic is echo’d to the serial port. This allows you to monitor the communications. You can also use the Serial port at any time, but it is not a good idea to do that while running a job. Here are the steps to set it up. Make sure #define ENABLE_BLUETOOTH is not commented out in config.h. Use a serial port terminal to set the Bluetooth name using $I=NAME, where NAME is the Bluetooth name you want. I don’t know all the naming rules, so keep it short and simple. There is no capability to use a password yet. Grbl converts all input to capital letters, so lowercase will cannot be used. Reboot the ESP32 to turn on Bluetooth with that name. Grbl will send Starting Bluetooth:ESP32BT as the first item when booting to let you know Bluetooth is on. ESP32BT is the Bluetooth name I used in this case. Grbl will now respond on either Bluetooth or Serial data. All Bluetooth sends are echo’d on the Serial port if you want to watch the data. You can now pair a phone or PC with Grbl_ESP32. Caution: Do not pair while running a job. 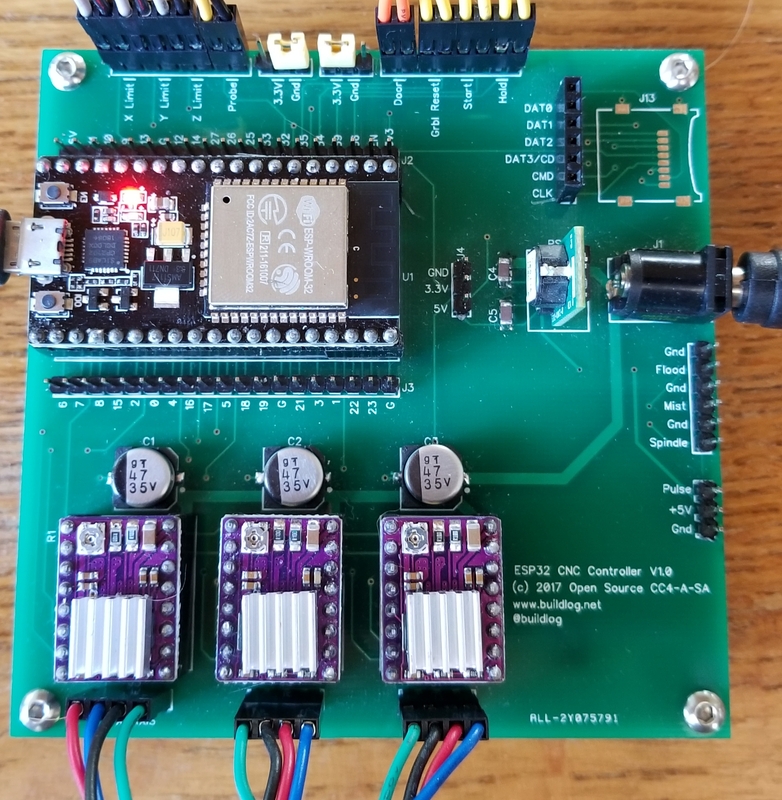 The ESP32 will likely interrupt and/or watchdog issues while the stepper timer is running and the pairing process is running. Other modes: A phone also makes an awesome display and control panel. Maybe the PC is the primary sender and the phone acts as a pendant. SD card. SD card is next on the roadmap. 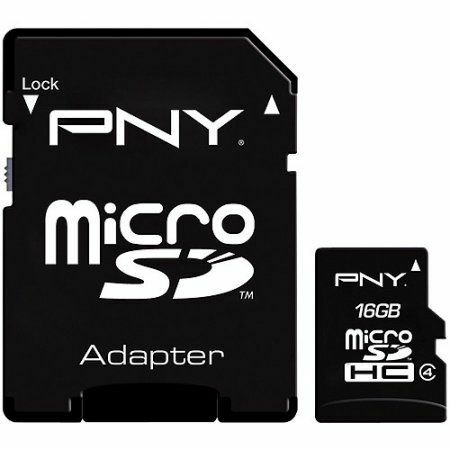 This pairs well with bluetooth, because the phone could select and start an SD card job. After a lot of work and testing, I have posted the firmware to GitHub. I have a good write-up on the process I went through to get to this point on this blog post. There are some basic getting started instructions on the GitHub page. 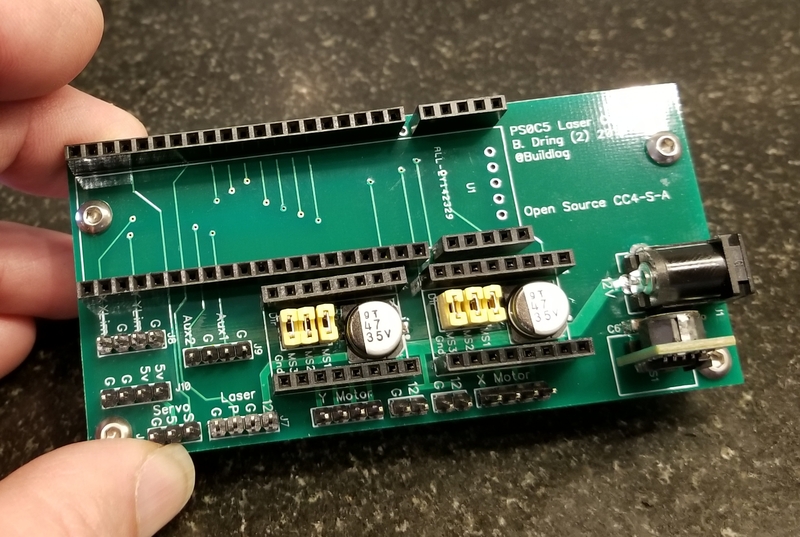 Realistically, this probably should not be your first Grbl or ESP32 project, but go ahead if you like. If you want to keep up to date on the project, subscribe to this blog (see end of blog), subscribe to my YouTube channel or follow me on Twitter (most frequent updates). Comments, thumbs up, retweets and replies are very much appreciated and keep me going. If you see any issues, please comment here or at GitHub. GitHub is preferred for firmware issue tracking. BTW: If you are interesting the test controller I made, here is a schematic. I have a busy couple of weeks coming up with some friends coming from France to visit. I won’t be able to work on the project much. The first thing I want to add when I get a chance is BlueTooth support. If you know of any similar projects streaming text from a phone or PC to ESP32 over Bluetooth, please let me know. I have been working on this for months. I am happy to announce that it is finally working right. 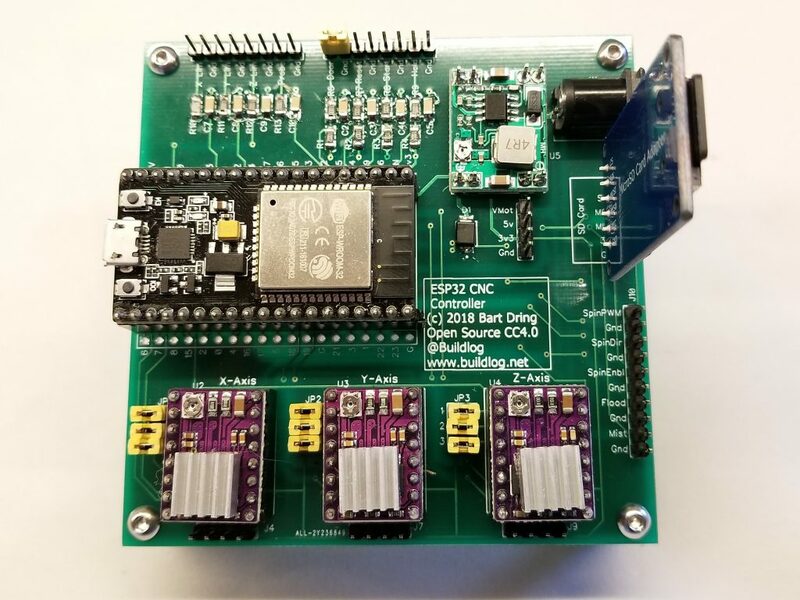 The ESP32 will be a great option for CNC. Here are some things I am excited about. Low Cost – $3-$10 depending how you buy it. BlueTooth and WiFi – This is great and actually the primary reason for my port. The bulk of the code was very easy to port over, but getting very low jitter, step pulse timing took a long time to achieve. This is not my first port of Grbl. My first port was to the PSoC5. That was much easier, but this was my first major project on the ESP32. A goal was to use the Arduino IDE to develop the code. I thought it would make the project a lot more accessible to novice programmers that just need to make a few tweaks. I also tried to make the code easy to maintain with Grbl. This means there a few throwbacks/workarounds to AVR port numbering. etc. 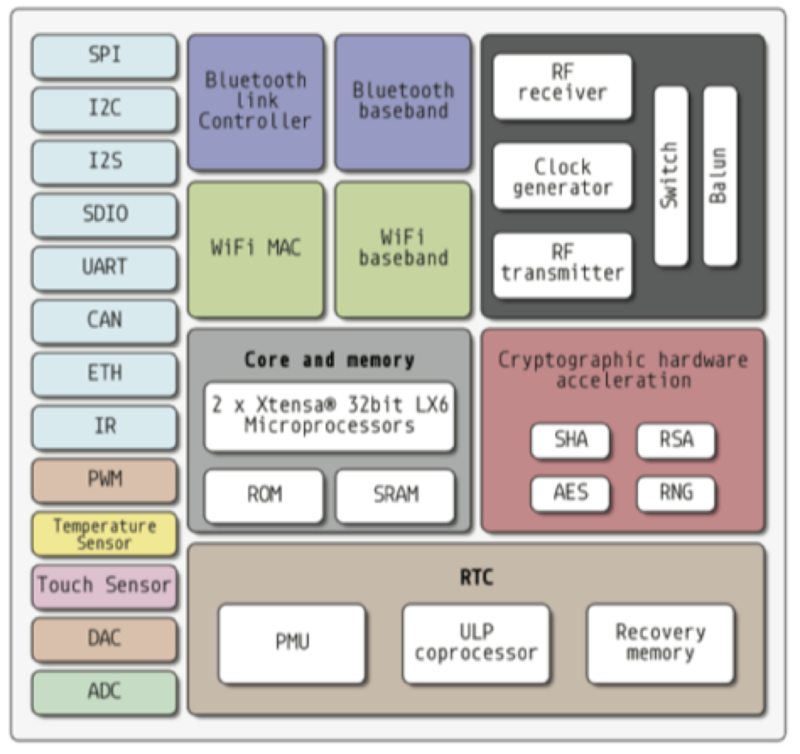 The ESP32 uses an RTOS (Real Time Operating System). While “real time” sounds perfect for CNC, it is not good for step pulse timing. An RTOS allows multiple tasks to run “at the same time” and it manages the priorities and interaction of those tasks. The RTOS switches tasks at a “tick rate”. The tick rate is typically about 1000Hz. This means each task gets at least 1ms of time and the others wait. You can designate a high priority task to prevent these interruptions, but some tasks have watchdogs that must be reset so you need to give them some time. You can set the tick rate higher, but I need a more than 50,000 hz step rate. That is not practical for the RTOS. I can turn off the RTOS and/or the watchdogs, but a major appeal of the ESP32 is the WiFi and BlueTooth. These need the RTOS. The normal Grbl way generate step pulse timing is to use interrupts. As long as you follow the rules for interrupts, they will interrupt the RTOS without any delays in very deterministic manner. The rules are about how much time you can spend in the interrupt and what things you can do in the interrupt. The interrupt duration was not an issue because the code in the interrupt only takes a few micro seconds. What you can do in the interrupt took a while to figure out. The ESP32 does a “panic” reboot when it does not like something. That happened a lot during development. Most of my problems were related to how I used the peripherals. Things like the RMT feature simply can’t be used. Start / Hold / Reset / Door switch connector. SD Card – This is just a breakout to a header that can be wired into the CPU if I ever decide to do that. Testing – I need to do a lot of testing. I tested most of the features along the way, but need to double check all the config options. BlueTooth – That is the first new feature I want to add. Hobby Servo Features – I use them a lot in my small machines and 328P Grbl doesn’t handle them well because the lack of 16 bit timer availability. I want high resolution jitter free servos as an option for any axis. Simple Kinematics – GCode can be converted on the fly to alternate coordinate systems. This would not consider joint dynamics. I added native USB support to my PS0C5 port of Grbl. The PSoC has USB capability on the chip. It also has a component for using it as a USB UART (CDC Interface). 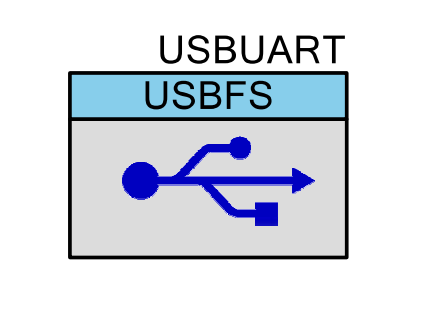 This means it looks like a serial port to the connected PC and uses the standard CDC interface driver that most OS have. I am currently only using this on the PSoC5 development board so I am comfortable using their VID and PID values. If I make some custom hardware and distribute it, I will need to get my own. Faster – It should be able to run a lot faster. You can select any baud rate you want. It never converts to TTL I think the rate is meaningless. I am not sure if it translates to actual fast jobs, but it might on data heavy laser type jobs where the laser power level is changing a lot. Compatibility – It still looks like a UART to senders, so you can use all existing senders. Future Features – It might be possible to have the USB look like multiple features like a memory device, to make file transfers possible. I put it in a separate repo from my last code. I started with a more recent version of Grbl, plus I removed the LCD code. I typically don’t use the LCD and prefer a serial/bluetooth remote. It could be easily added back in from the original port. The USB is checked for incoming data in the protocol_main_loop(). Is there a way to do this with an interrupt? Arduinos have a DTR triggered reboot. Some senders expect this. Can we emulate this behavior? Then try to make that accessible as a USB drive. If you want to help, just let me know via comments below or on the GitHub page. 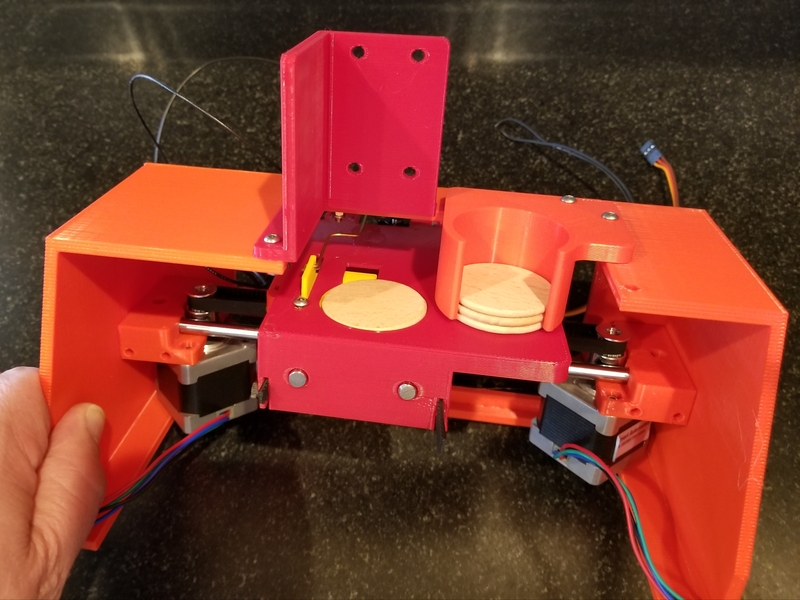 The NickelBot has been running great, but there were a few features I also wanted to add. I made a rev 2 PCB to address them. There is a door switch that cuts power to the laser. I did this by splicing into the 12V power line going to the laser. I thought that was an effective, but ugly hack. There is now a dedicated connector for that switch. On rev 1, the fans run continuously. This reduces my run time, when I run off a battery. I added a FET to control the fan power. I want the fans to turn on whenever the laser fires and stay on for a few seconds after the last pulse. Since the controller is a PSoC, I was able to implement this as a custom hardware peripheral. I used my pulse extender component. Here is the schematic. The trigger is connected to the PWM signal going to the laser (labeled spindle). There is a 16 hz clock that is used to count down a short delay after the last pulse. Using a connected computer sort of spoils the coolness of these tiny machines. Using a phone and BlueTooth is way cooler. Most of my other tiny CNC machines use BlueTooth. I don’t know why I forgot it this time. It is the first time using an HC-05/HC-06 bluetooth adapter with PSoC, so that might be the reason. I decided to use a second UART, so I could use both USB/Serial and Bluetooth at the same time. The changes to firmware where pretty trivial. The main Android phone app I use is Grbl Controller. It really works great and is so easy to use. It works great with the cheap HC-05/HC-06 BlueTooth adapters. 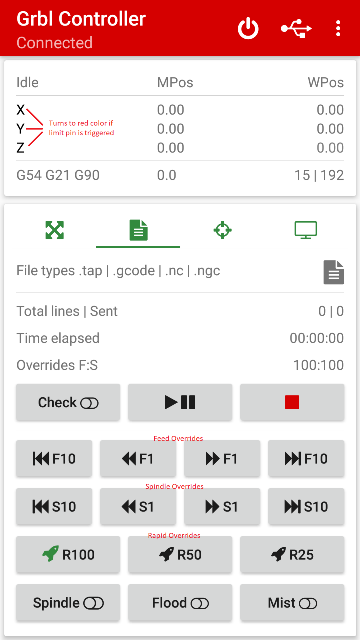 I just send gcode files to my phone and run them from there. I can even turn the phone “off” and stream from my pocket. 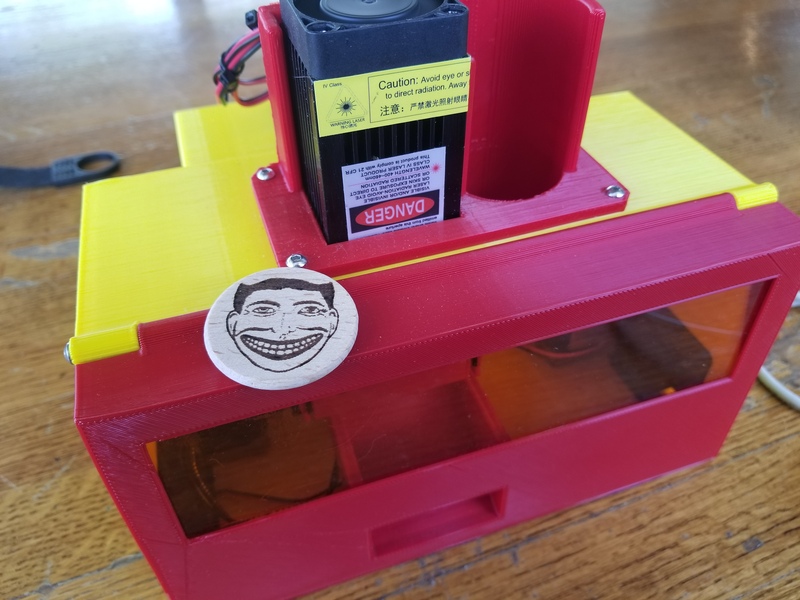 The NickelBot is complete and it works great. 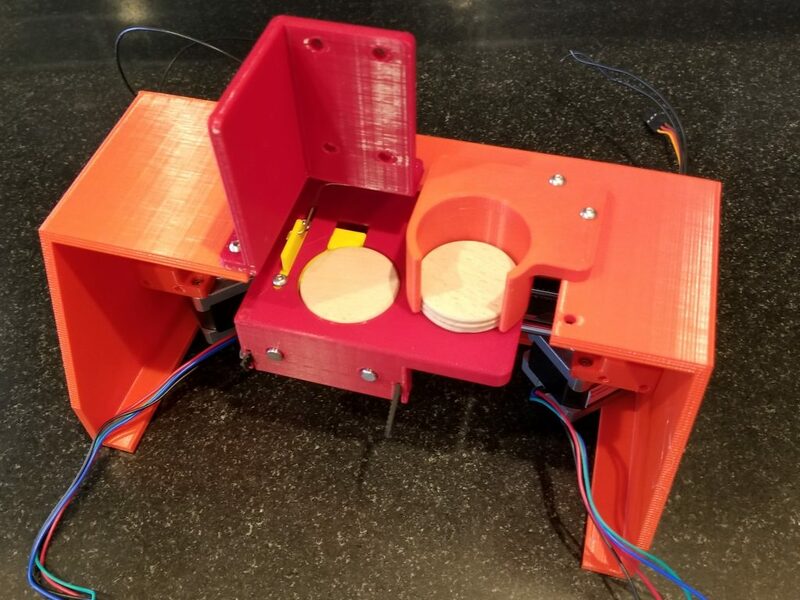 The goal of the project was to create an easily portable machine that creates low cost items that could be given away at events like Maker Faires. I think it has completely achieved that goal. The nickels are purchased from Amazon and cost about $0.08 each. Here is a video that explains the machine. It is quite reliable and the cycle time is is just about right at 1-2 minutes per nickel. I think the engraving quality is quite good. I ran it at the Chicago Northside Maker Faire last weekend. It made about 60 nickels without any problems. Here are some of the nickels it made. 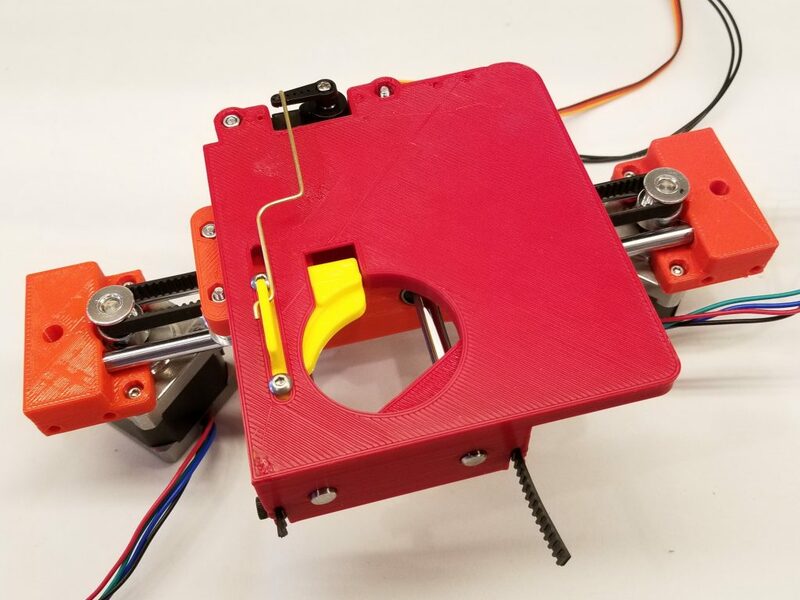 The NickelBot uses (2) NEMA14 stepper motors in a T-Bot configuration. These drive a single GT2 6mm belt. The linear bearings are (2) 6mm rods per axis with (1) LM6LUU per rod. To handle the nickel loading and unloading, it uses a single micro hobby servo. 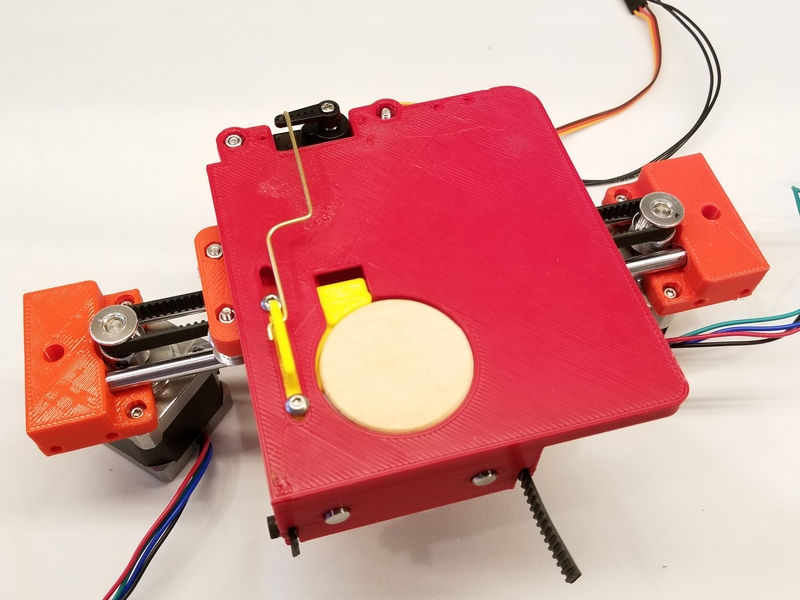 This servo connects via a 0.03″ brass wire to a clamp. 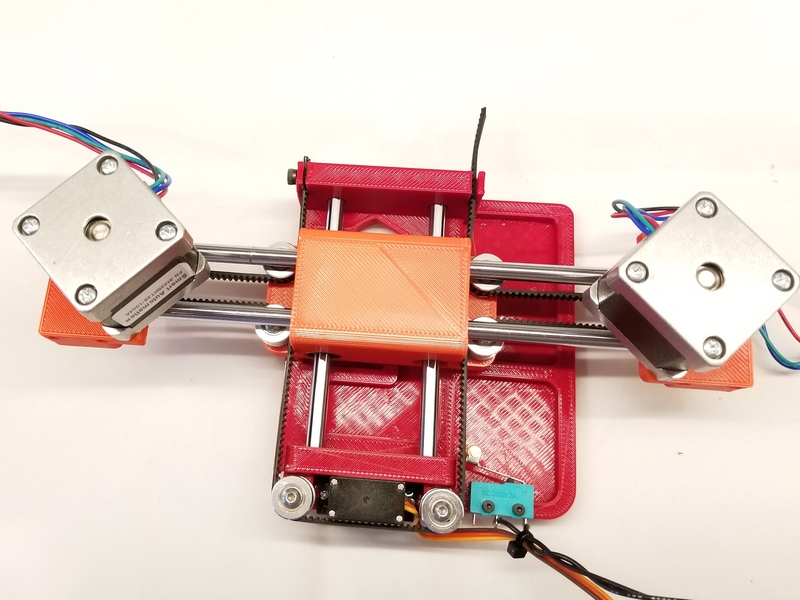 The firmware has (3) positions hard coded for the servo for fully open, nickel support only and supported plus clamped. All 3D printed parts are PLA printed on a Lulzbot TAZ6. The colors just represent the color that happened to be in the printer at the time. The laser module is a 3.5W peak, 450nm (blue) laser. 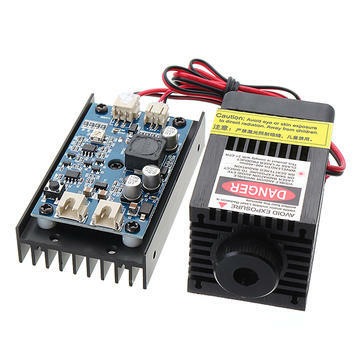 It comes with a laser power supply that has a 12V power input and TTL laser control input. It also comes with a 12V 5A power supply. I bought it a few months ago from Banggood.com when it was on sale for about $70, but they are typically around $99. I control the engraving power with a 5kHZ PWM from the microcontroller. 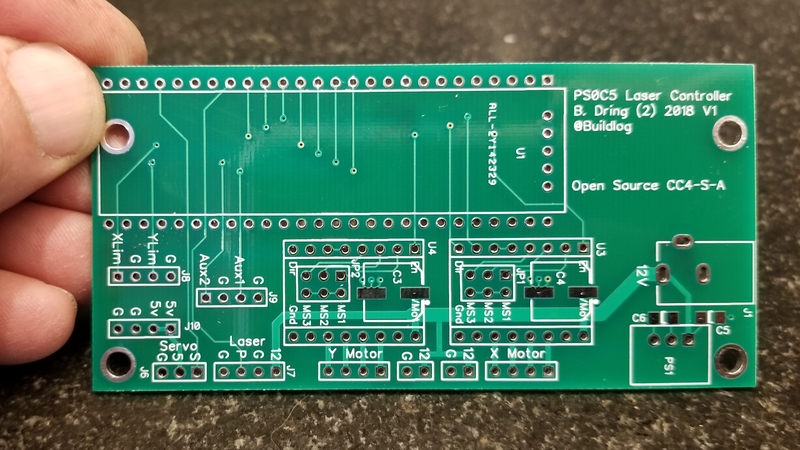 I used a PSoC5 development board as a plug in on a custom PCB. I knew adding an additional, accurate PWM for the servo was going to be vastly easier on the PSoC5 vs. an Arduino. 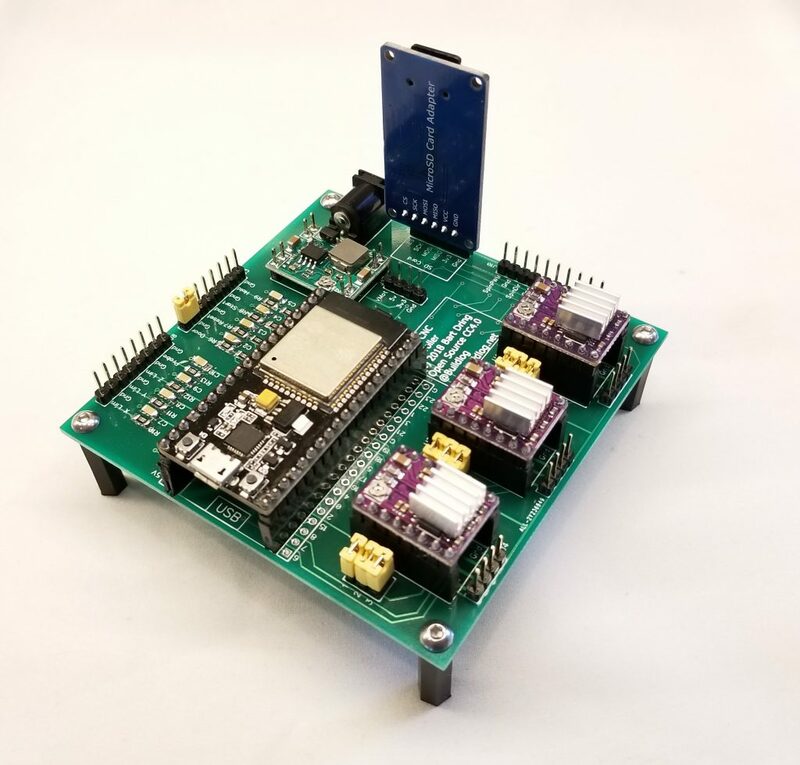 This dev board has a built in programmer debugger that makes firmware development very easy. It is great to be able to set breakpoints and check values with the debugger. I have have a another blog post with more details on this here. The firmware is a modified version of my PSoC5 Grbl port. The only modification needed was the code to handle the clamp servo. Rather than adding special gcodes for the clamp, I simply re-coded the M7,M8 and M9 coolant commands. I did this because all of the parsing and protocol issues were already done. Each command represents one of the clamp positions. I may post the source code on Github soon. The machine has (2) home switches (X and Y). A homing sequence needs to be run each time you power up the machine. All other locations are referenced to this location. A one time calibration is done to locate the following locations. G54: G54 is the the default work offset. I decided to use the center of the nickel as the 0,0. I jogged the machine visually until the nickel looked centered. I then set the G54 location with this gcode line”G20 L10 P0 X0 Y0″. I made a target shaped graphic that I used to test engrave this location(see above). I used a caliper to measure the centering error, jogged that amount and reset the 0,0. I did this about 5 times until I was satisfied with the centering. G28: I used the G28 location as the location under the nickel hopper. You jog to the location and set it with “G28.1”. G30: I used the G30 location as the position over the eject chute. This is set with the G30.1 gcode command. This is a great program for this application. 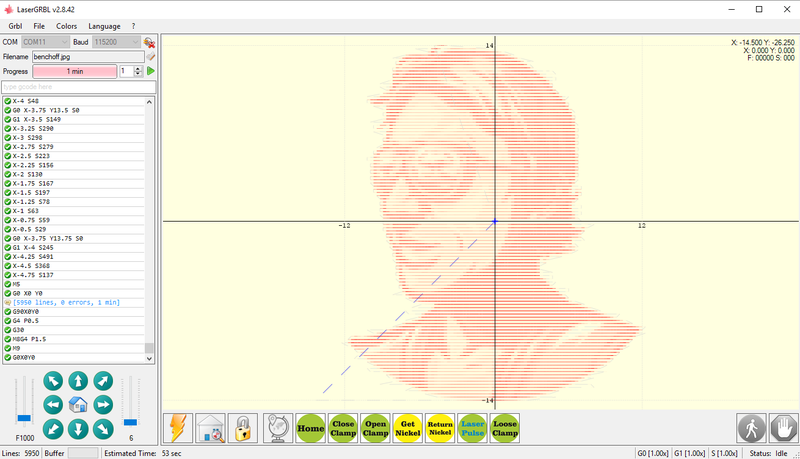 It does everything, starting with a bitmap image, to gcode sending in one application. It also has some macro (multi-line gcode) buttons that are very handy. The only drawback for some is that it is Windows only. Here is an example of the macro to get the nickel. Interlock switch: Right now there is no interlock switch for the door. If I make a new PCB, I will add a provision for that. I’ll probably just break all power to the laser module. Nickel Flip: Right now the nickel always comes out of the chute upside down. This is not the best presentation. This was a compromise to make the machine as small as possible. The nickel has to fall between the Y rods. Rather than makethe distance between the rods wider than the nickel, I designed and aligned the clamp/support system so that one side of the nickel falls first and goes between the rods closer to vertical. There is a probably a way to design the chute to catch the nickel before flips over completely or re-flips it back. More automation: LaserGRBL has macro buttons for the nickel feed and eject features, but it would be nice if that was automatic. They have added a gcode header and footer feature to the roadmap. Right now you can generate the gcode, save the file and paste the nickel handling code in an editor. That file is then fully automatic. Customizing: It would have been fun to easily add names, etc to nickels for people. 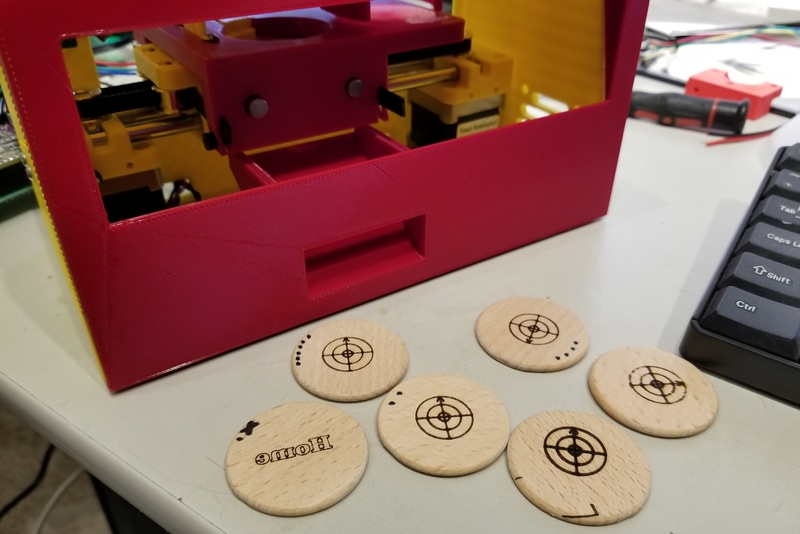 Here are some details on the custom laser controller I made for the NickelBot, wooden nickel engraving machine. I want to use Grbl to control the machine. Grbl has support for lasers that allows better power control during the engrave. It also has the Core XY support I need for the H-bot mechanism it uses. The only feature I needed that it did not have is a hobby servo output. A hobby servo requires a PWM signal. 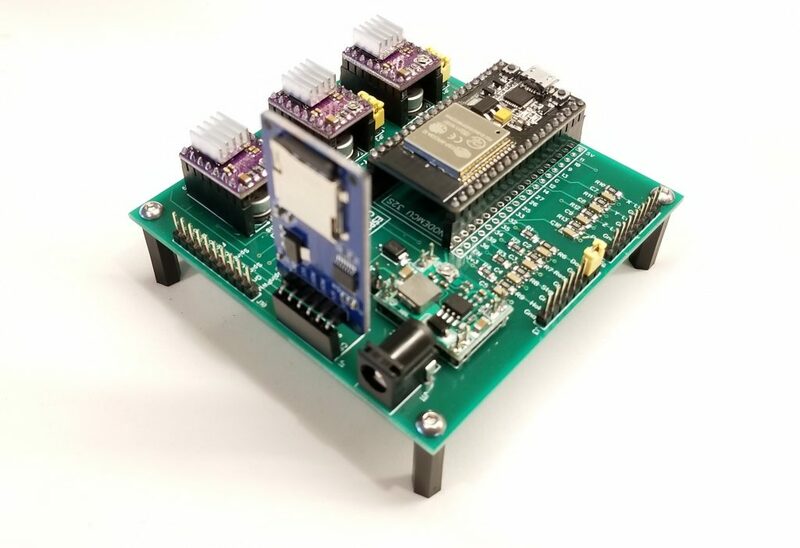 Normal Grbl runs on a ATMega328p cpu (Arduino UNO). The 328p has 3 timers that can be used to generate PWM signals. Grbl uses all 3 of them. 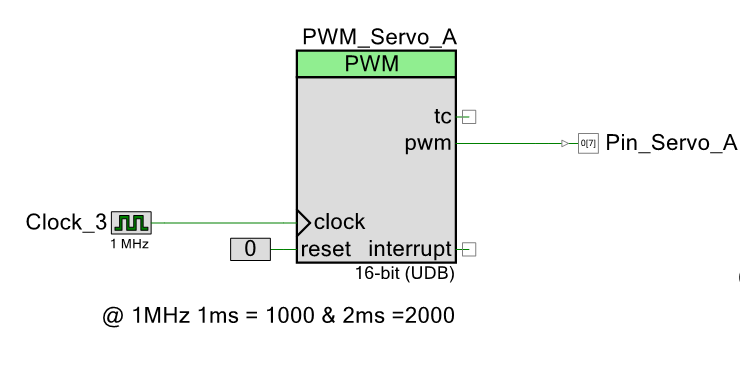 You can attach more than PWM output to a timer, but the only timers that would work are only 8 bit timers. That is not going to give me the resolution I want. A hobby servo uses a 1ms to 2ms pulse that repeats every 20ms. This means you are only using 1/20th of the duty cycle range. 1/20th of an 8bit signal is pretty rough. I could have used an Arduino Mega to get some more free timers, but I did not want to deal with the physical the size of a Mega. Here is an image of the raw PCB. Has a socket for a CY8CKIT-059 PSoC5 development board (only $10-$15). The only drawback is the wiggly printed USB connector. (2) Sockets for Pololu footprint stepper drivers. Extra 5V power access connector. The board is fully tested and 100% functional. I have it hooked up the the machine and have tested the following. The control signal on the laser supply appears to turn on the laser if left open. Therefore if the controller is not powered or actively driving the pin low, the laser will fire. That is not good. I have not tested a solution, but I think a resistor of 2k-5k Ohm pulling the pin to ground will keep the beam off when not driven low. It should be quite easy to solder this resistor between the laser pulse pin and the adjacent ground pin. I got a chance to do some work into this project and I made some progress. The X,Y mechanism is a free standing H-Bot. Here is a bottom view. You can see the Y home switch and the bottom of the servo to control the nickel. Here is a top view of the mechanism. The yellow clamp piece opens partially to create a platform (ledge) for the nickel. This slides under the nickel feed tube and a nickel drops in. The bed is extra wide, so there is always something supporting the nickels in the feed tube. The servo then clamps the nickel by pushing the tang on the yellow clamp piece into the nickel. Once the engraving is complete, the clamp completely retracts, removing the ledge. The nickel falls through into a hopper that is accessible from the front. This allows for a fully automated process and you don’t need to open the machine. Here it is with a nickel in the clamp. I have a temporary enclosure for testing. This supports the XY mech. You can see the nickel feed tube and the laser module support bracket. Currently it is open and a little larger than necessary to make it easy to test. It will eventually be cleaned up and get an access door with a window. The next step is to work on the firmware. I plan to use Grbl in Core XY mode. I need to add a way to control the servo and figure out some commands to control the nickel handling. You are currently browsing the Buildlog.Net Blog weblog archives.